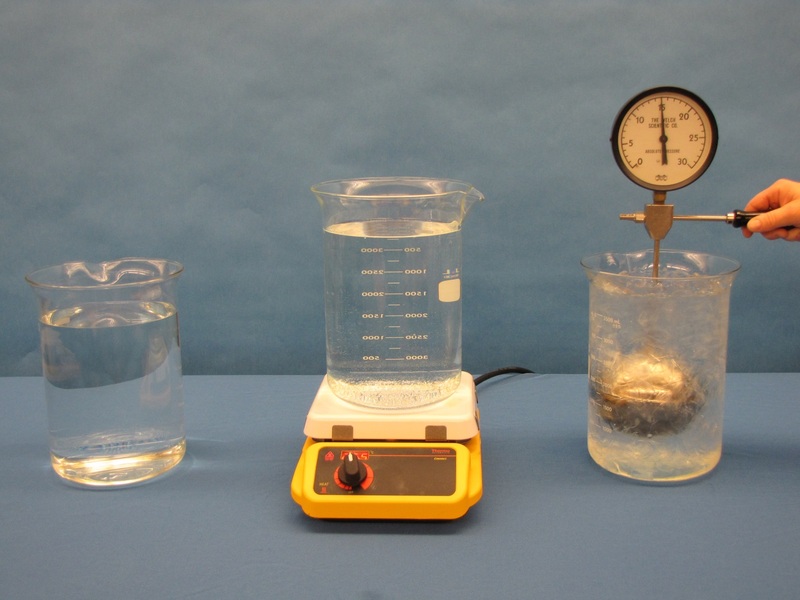 This demonstration will indicate how the relationship between temperature, constant volume and pressure can lead to the determination of the temperature for Absolute Zero. Absolute Zero is defined as the temperature at which a gas exerts zero pressure. Using this concept, this demonstration will determine the temperature of Absolute Zero. The activity starts with three beakers filled with water at different temperatures: hot, room temperature and cold (an ice bath). Place the Absolute Zero Apparatus in each beaker and record the temperature and pressure. Graph these three pair of values on a temperature versus pressure graph. Determine a line of best fit through these points as it can be derived from the Ideal Gas Law that temperature versus pressure with a constant volume is a linear relationship. If using a graphing program, determine the equation of the line of best fit in slope intercept form. The intercept will be the temperature of Absolute Zero. You can also make a hardcopy of this graph and extend your line of best fit. Extend this line so it will intercept the temperature axis. The value of the intercept will be the temperature of Absolute Zero.